What would you think if someone told you one of the world’s most nutritious foods was also tasty, could be cooked many different ways, was easy to find, and was totally free? I know what I’d do: I’d run out and grab some! Well, the good news is, there is such a food: dandelions. Right now, some of you are crinkling your noses and saying, “Ick!” Others probably think I’ve gone crazy. But it’s true. Dandelions, those pesky weeds with bright yellow flowers that you’ve grown up thinking are the enemy of perfect lawns, tidy sidewalks, and weed-free flower beds? They are actually food. Dandelions aren’t native to North America. They were actually brought here—on purpose—by immigrants who knew what valuable food they are. In fact, dandelions have an important place in American culinary history. They helped keep the early settlers alive; they made the pioneers more healthy; they even helped make family food budgets stretch further during The Great Depression and World War II. But somehow, after the war, the role of dandelions in the North American diet declined. As super-grocery stores packed with a wide variety of foods became the norm, more people put off dandelions for more “modern” fare like soup in a red and white can and macaroni and cheese in a blue box. Happily, today wholesome food is making a come back. Gourmet restaurants serve up dandelion greens (but rarely other parts of the plant), charging hefty sums. Health food stores carry dandelion leaves throughout most of the year. High end grocers do, too. You can even buy dandelion seeds from some of the nation’s best home gardening seed suppliers. But you don’t have to spend lots of cash to enjoy the nutritious goodness of dandelion leaves, flowers, buds, stems, and roots. You can take advantage of this super food for the mere cost of taking a few minutes to pick and wash it. I think you’ll be pleasantly surprised by all you can do in the kitchen with dandelions. Whether you want to make salads, soups, quiche, noodles, enchiladas, pickles, ice cream, or cookies… you can use dandelions. Bon appetite! 1. Never harvest dandelions near roadways, where the plants soak up chemical fumes, or from any location where chemical sprays (such as weed killers) may be used. 2. Always positively identify any wild plant before eating it. 2. Leaves and stems growing directly from the rootstalk in the soil. 3. One flower per stem. 4. Stems without branches on them. 5. A milky white sap when a stem is broken. When we think of dark, leafy greens that are good for us, most people think of spinach, kale, or maybe collards. But dandelion leaves compete with these more popular greens—sometimes even coming out ahead of them. For example, they beat out spinach in terms of protein, vitamins A, C, K, Omega 6, iron, phosphorus, potassium, and calcium. 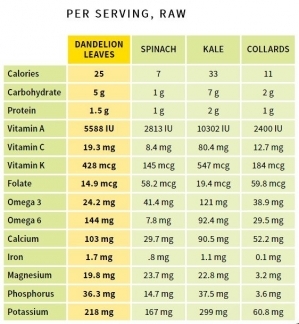 Dandelion leaves taste a lot like other leafy greens, especially collards, but have a slightly more bitter flavor. However, if the leaves are harvested early in the spring, before buds appear on the plant, they aren’t as bitter as many popular salad greens. Cooking the leaves also reduces or completely takes away the bitterness. The window in which dandelion leaves are naturally tasty and not too bitter is short. You must catch the plant before it sends out buds. If you live where snow is the winter norm, start looking for dandelion leaves as soon as the snow melts. In warmer regions, begin looking around November or December. Take advantage of the dandelion’s short season by harvesting as many leaves as you can, preserving them for future use. 1. Pick the dandelion leaves anyway, then bring a pot of water to a boil. Add the leaves and simmer for 3 minutes or until tender. Taste. If the leaves still seem bitter, repeat with fresh water. This removes much of the bitterness, but also some of the dandelion’s nutrients. 2. 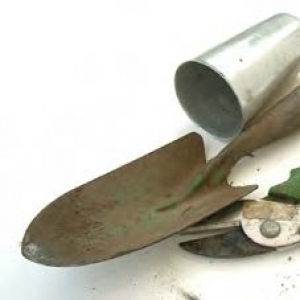 Cut off all the dandelion’s leaves, stems, buds, and flowers at the soil level and allow the plant to re-grow. Some people also cover the plant with a box, bowl, or other object that completely blocks out the sun. The new leaves will be almost as good as early spring leaves—but if the plant is covered, the nutritional content will be slightly reduced. 3. If the leaves are still youngish, but the plant has sent up stems and buds, try soaking the leaves in salt water, as the French do. Or, use apple cider vinegar or lemon juice. 4. Wait until fall. After a couple of hard frosts, most of the bitterness will disappear from the leaves. 5. Pull up one or more plants by the roots. Pot the plants. Cut back all the leaves, stems, and flowers. Bring the pot indoors before the first hard frost and place near a sunny window. When new leaves emerge, harvest them right away. Keep doing this, and you’ll have a continual supply of good dandelion leaves. If you enjoy kale chips, give dandelion chips a try. 1. Preheat the oven to 325 degrees F. Line baking sheets with parchment paper; set aside. Cut the dandelion leaves into the size of your choice — usually about the size of a potato chip. Or, leave them whole. 2. In a bowl, mix together the oil, lemon, garlic powder, and salt. Toss the leaves into this mixture. 3. Lay the leaves in a single layer on the baking sheets. Drizzle the remaining oil mixture over the leaves. Bake for 12-16 minutes, watching carefully to ensure the chips don’t burn. The leaves will harden as they cool. If desired, you may make dandelion chips in a food dehydrator set at 135 degrees F.
1. Place the potatoes in a large pot and cover with water. Place over medium high heat and bring to a boil. Boil until tender; drain, reserving the water. 2. In the meantime, fill a clean sink or bowl with ice water and preheat the oven to 400 degrees F.
3. Pour the water back intot he pot and bring back to a boil. Add the dandelion leaves and cook 1 minute. Drain and place leaves in the ice water. Once cool, drain and chop. 4. Mash the potatoes with a potato masher or mixer, adding a little olive oil to make them moist. Mash the leaves, adding oil, if needed. Fold the leaves into the potatoes and season with salt and cayenne pepper or paprika. 5. Pour the potato mixture into a casserole dish and sprinkle with breadcrumbs. Drizzle with a little olive oil and season with salt and cayenne pepper or paprika. Bake about 15 minutes , or until breadcrumbs are golden.